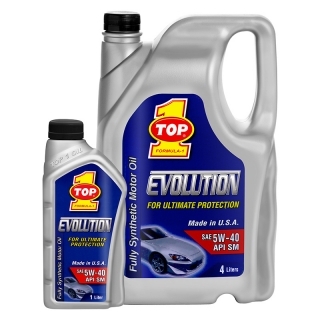 TOP 1 EVOLUTION (PCMO) is a blend of premium synthetic base oils and selected additives, designed to give excellent performance in all modern passenger cars having emission compliant engines. This engine oil contains an effective additive system that keeps the modern passenger car engines highly clean. It can be used for all new and old engines using flex -fuel blended with ethanol. Recommended for all modern passenger cars that specify API SM / CF, ACEA A1/B1-04 & ACEA A5/B5-04 requirements. It also meets ACEA A3/B3/B4-04, MB p229.31,VW 502.00/505.00,BMW Long life - 04,MB p229.51 & ACEA C3-04 (Mid SAPS) requirements. Meets and exceeds all new Passenger Car requirements. High TBN helps extend drain intervals. Backward compatible with all Old and New engines.